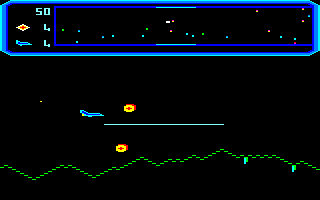 An early Defender clone for the CPC. In this version, you defend canisters littered along the landscape from a hostile alien race called the Reeg forces. When a Reeg ship lifts a canister and reaches the top of the screen, the cargo changes into a mutant hellbent on destroying you! Fail to kill all the baddies quickly enough and another group of ships appears, moving much more quickly, their cannons firing at you. 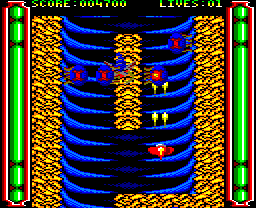 The game is a fast side-scroller, frantic and colourful even though the original only had primitive graphics. It's quite a hard game where you will run out of ships very quickly. There's no music and only a few sound effects – listen to the explosion sound effects when you die. Overall, a good conversion of the original that is only let down by how difficult it is. One of the most famous 8-bit games of all time, this is a faithful conversion of the classic multi-player arcade hit. You and a friend can choose between the wizard, valkyrie, barbarian or the elf. Lying before you is a dungeon comprised of countless levels filled with all kinds of treasures and horrors imaginable. Battle your way past ghosts, ghouls and a wide variety of evil monsters using magic and potions, as you desperately try to escape before your health runs out. Both graphics and sound here are delightful and once you get into this game, many, many hours can be lost! 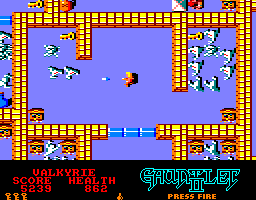 There is also another version of the game called Gauntlet: The Deeper Dungeons, which contains lots of levels designed by Gauntlet fans. 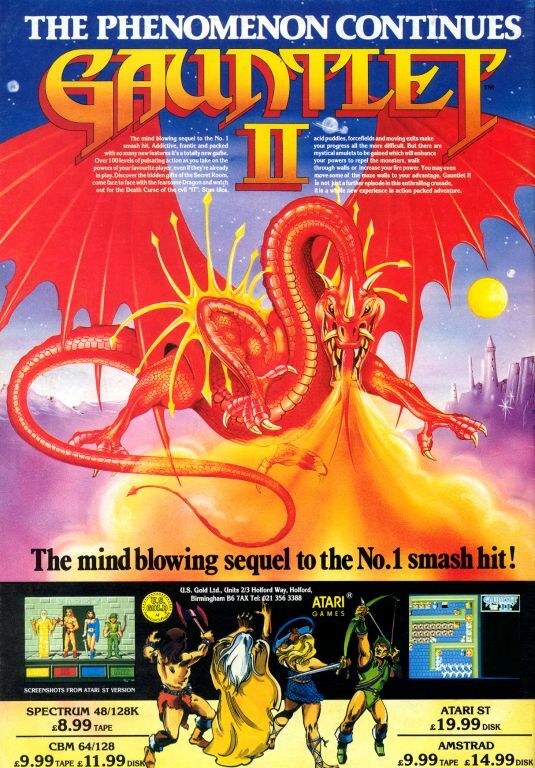 See also: Gauntlet II, Gauntlet III. 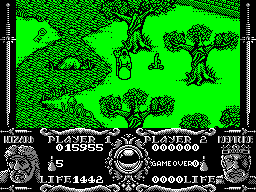 The game that follows on from the original has much the same layout, although some new features have been added. There are health-draining force fields and new monsters such as sorcerers, blobs of acid, and a black monster that homes in on you and saps your health. The levels also start changing randomly after level 5. Less important is the ability to choose what colour you want your character to be, and if you're playing with a friend, it's now possible for both of you to choose the same character. The graphics and sound effects are just as good and the game is as good as, if not better than, the original. See also: Gauntlet (US Gold), Gauntlet III. The third instalment of the Gauntlet series is quite different from the previous two games. The game takes place on the island of Capra, which is divided into eight sections. The Devil has come from hell and unleashed his evil monsters, and you must kill them and return the Devil to where he belongs. The most obvious change is that the game is viewed in isometric 3D. 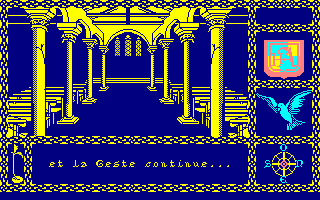 However, it's also a Spectrum port, albeit one with very detailed graphics. Could we not have some more colour? You also have a choice of eight characters instead of four, and instead of dozens of small levels, there are now eight very large levels. There's a lot of walking involved, as each level is essentially a treasure hunt, but it's still a good game – if you're a Gauntlet fan, that is. See also: Gauntlet (US Gold), Gauntlet II. 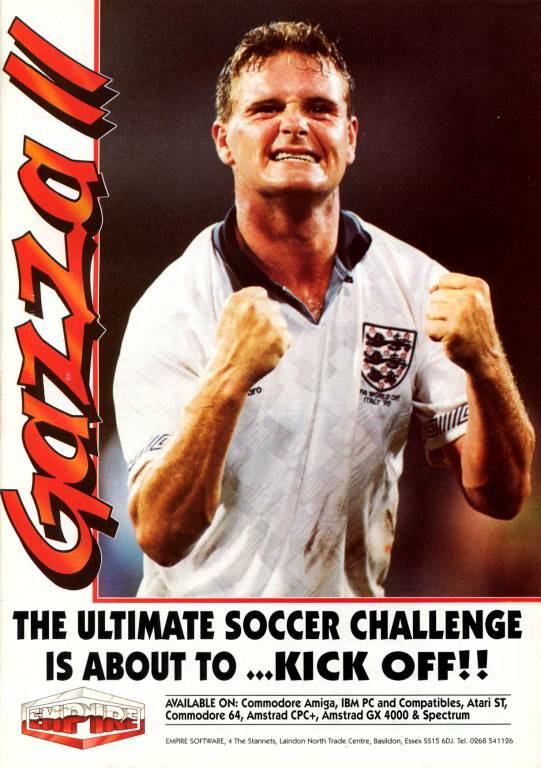 Gazza may be a has-been now, but there was a time long ago when he was a rather skilful footballer. 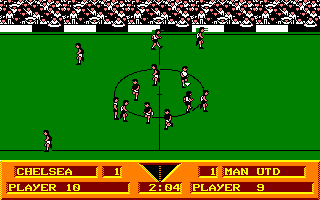 Unfortunately, this game (known as Bodo Illgner's Super Soccer in Germany) is utter tosh. You can choose to play in either a league or a cup tournament, or just have a friendly match. The players can be renamed and their statistics adjusted. All this detail sounds impressive; it's when you come to play the match that you start to scream. The scrolling is extremely jerky, and it's difficult to control your player. In fact, it's difficult to see which player you are trying to control. And is that noise supposed to be the crowd cheering, or is it interference? This is a really nice football game, although it doesn't allow you to play in a league or a knockout tournament. The difficulty of the game depends on who you choose to play against – Albania are the weakest team, Brazil the strongest. 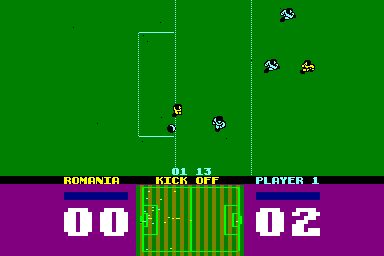 Alternatively, you can play with a friend, although there's an annoying bug where the two teams swap colours at half time. Two nice features are the boot-o-meter, allowing you to control the strength of your kicks by holding down the fire button, and a radar screen which shows where the ball and all the players are. The game is very easy to get into, and with an amazingly cool tune on the menu screen, it's a winner. 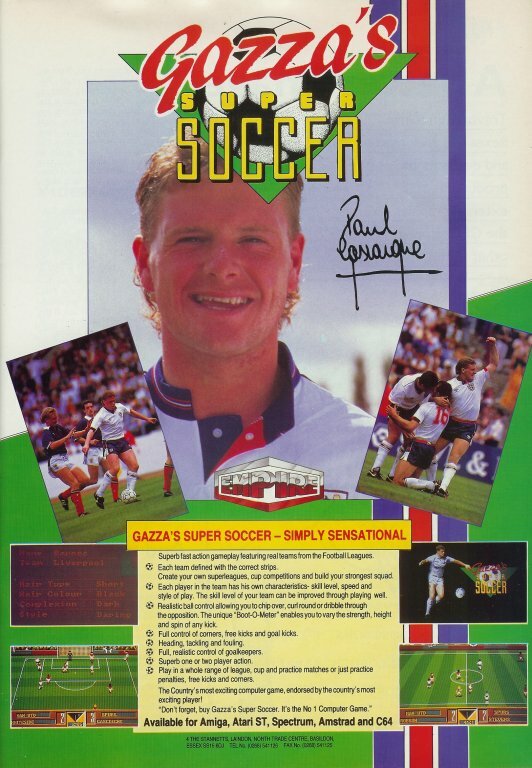 See also: Gazza's Super Soccer. In 1930s America, air races used to be held in which planes and their pilots would race around an open-air course which would usually be marked on the ground with pylons or other markers, and they proved to be very popular with the public. 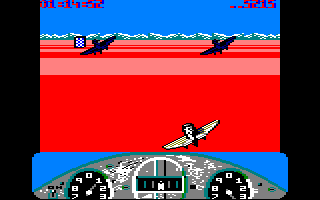 This game sees you taking part in such a race, except that there are sixteen courses to fly, and that instead of racing against other planes, you have to complete the course within a set time limit. However, you do have to dodge planes coming in the opposite direction! The music on the menu screen is nice, but the game is rather boring, the sound effects are poor, and the graphics are rather garish. "DIE ALIEN MUTANT SCUM!," screamed the headline of the Soonday Spirit. Of course, the aliens took great offence to that, and now the entire galaxy has declared war against Earth. 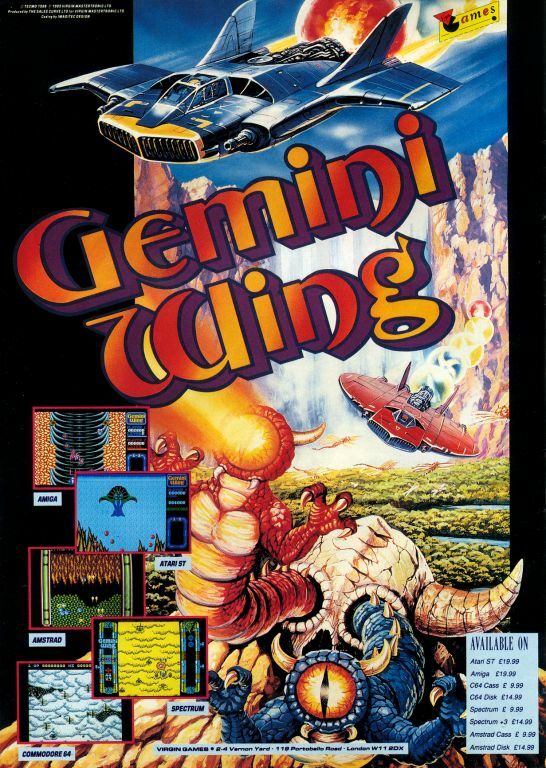 You've been sent out to stop them in the new Gemini Wing fighter. As well as the standard firepower, you can also collect power-ups in the form of gumballs which hang on to the tail of your craft, and they can be unleashed one at a time. To be honest, I don't like the game much. The graphics are nice, but the sound effects are pathetic and the collision detection is dodgy at the best of times. Geoff Capes is a former athlete who won the title of Britain's Strongest Man and World's Strongest Man on numerous occasions during the 1980s. 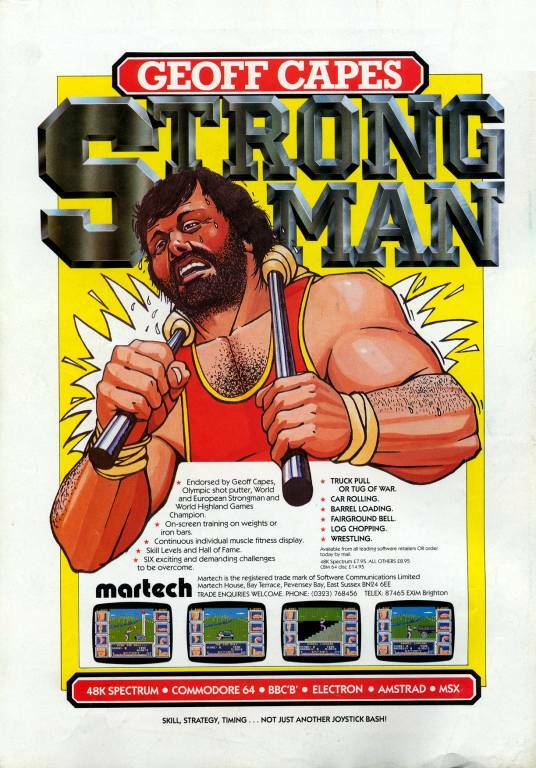 The game begins with a training session in which you waggle the joystick left and right as fast as you can to build up your muscle strength, which you must then distribute among eight muscles which are displayed on the screen. In most of the six events, a muscle is highlighted and you must move a cursor and select it quickly. You also need to adjust the amount of effort Geoff puts in; too little or too much results in either Geoff not qualifying or becoming too exhausted to continue. The graphics are reasonable, although the music is poor. It's difficult to understand how to play the game at first, but once you do, it becomes a fairly interesting game to play. Your father has been kidnapped and his house burnt to the ground. You pick a few items and try to find him in a strange and deserted land. This is the start of a good text adventure game, featuring nice MODE 1 graphics. Unfortunately, the plot is very, very linear and the game too short. All you can do is choose between two or three actions that appear in a window – and making the wrong choice often means death! There is no music, except at the very beginning (but it is rather bad anyway). However, it is an interesting game, where you always want to explore further.